Aluminum and Steel Staging is packed and ready to go! Granite Industries is excited for another year at the MATRA Show! We have continued to develop and modify our line of products. The new Multi Mover hand carts and bleacher options will save time and money. The AXIS and Signature staging continue to be rock solid options for long term quality and performance. Granite offers a wide variety of products covering everything from staging to electric wheelbarrows. While most products can be used in the tent industry we have specifically focused in on four primary product groups for the 2014 MATRA Show. Each day leading into the show we will be featuring one of those product groups. The first featured item is our staging. Granite has worked to develop top quality staging that can be quickly assembled. 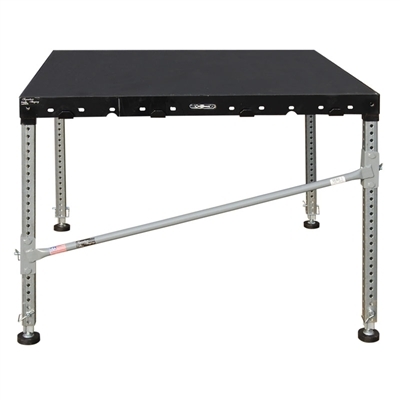 Signature steel staging features a steel frame engineered here in the USA. The steel is then powder coated to ensure long life and a quality appearance. All Signature Staging comes standard with a 3/4″ plywood deck. The deck rates at the industry standard of 125 pounds per square foot. Optional high traffic carpet can be added for better acoustics and appearance. Legs are made from steel as well and are adjustable from 4″-30″. AXIS Aluminum staging has been developed in house over the last couple years. The market for aluminum staging is continuing to grow based on its lightweight properties and appearance. AXIS staging uses a unique mounting system that ensures a custom fit for each leg. The AXIS frame is made in the USA. 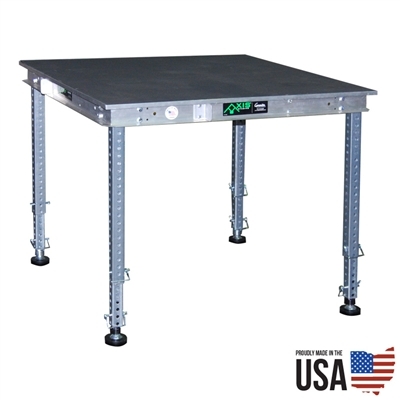 It includes steel legs and is capable of handling the industry standard 125 pounds per square food. Adjustable from 4″-30″.